missvjw wrote: i always wondered why i liked them so much compared to jacks and tonys. apparently they are just a better grade of frozen pizza. Jack's and Tony's are about the worst ones I could imagine. there are worse than jacks and tonys. tonys is bad but i've had worse. Cito wrote: Thirty years ago when Tombstone was still a small Wisconsin company, their sausage was spicier with a gravel-like texture. Every self-respecting neighborhood bar in Chicago served them, baked in the small electric toaster oven that Tombstone provided. Tombstone pizza achieved cult-like status at that time, and then it was introduced to supermarkets. Back in the day AKA "Too-Stoned Pizza" . This was also a time when every self-respecting neighborhood bar in Chicago poured Old Style...and most nites both tasted just fine!! I added some kalamata olives I had in the fridge and the baked product looked pretty good. However, even after adding red pepper flakes, oregano, and extra Parmesan, it was surprisingly, (or maybe not,) flavorless. Especially the crust. I'll be sticking with the CPK and Amy's brands. I have to say, I've been eating the Culinary Circle Spinach and Feta off and on for the last six months and it's really not bad. Anybody else like the New York Slices frozen slices from Jewel? Certainly not a major, nationally distributed option, but for those of us in the north suburbs of Chicago it's not a bad way to go. I've even heated them up in the toaster oven at the office to mild success. I thought they were OK and better than expected given that they are fully cooked then frozen. I thought the crust suffered from being too sweet. Added a Home Run Inn "Premium" Sausage to the mix yesterday. It certainly is much better than their standard fare. So far though, I think Doreen's is still holding a slight edge. Costco's Bellatoria frozen pizza is what I have been buying recently. We like it for its cracker-like crisp crust when baked directly on the oven rack. The sauce has a nice tang and there is not too much cheese. It seems to come only in a pepperoni version. Came across Vito & Nicks II frozen pizzas at the Elmwood Park SuperLow on Grand Ave. This is very Good "frozen" pizza . Cooking can be a little tricky. It can go from perfect to burnt very quickly. It took me a couple of attempts to get it right (for me). Needs to stay in the freezer until you put it in the oven. Preheated 400 oven directly on the rack. Start watching it after 15 minutes. I really love a crispy crust for most of my pizzas, and frozen is no exception. For most pizzas I use the cold oven trick. I simply put a pizza in the oven when it's off, turn it on to the temp I want, and that's it. Since only the bottom burner is used during pre-heat, the crust cooks the entire time, while the top takes longer. By the time the oven hits optimal temperature, the pizza is usually done or close to be. I don't even mind if it gets a little burnt on the bottom, but that's me. If you feel the bottom is done, but the top isn't, switch to the broiler and you'll be all set in no time. Having said that, I'd like to try one of those Vito and Nick's Frozen Pizzas, since I live pretty far from the restaurant. I was up in Kenosha at Woodman's Market yesterday and I couldn't believe the frozen pizza section. For starters, this might be the largest grocery store in the country - it's certainly the largest I ever saw. It's open 24 hours too. Anyway, I felt like a kid in a candy store with all the local pizzas they sell. I ended up getting 7 different brands (all local Wisconsin companies) and there were still more local brands I didn't get! In addition to all those pizzas, they have all the major pizza makers, and what looked like the entire line of every pizza makers. I even saw things like Freshetta's pizza crust (like Boboli) that I never saw in a store before. I just hope at least one of the pizzas I bought is a winner! Just okay. Very little cheese on them. Jewel sold a similar Kosher product from New York, JB's, that was much, much better but it appears to be discontinued. The Whole Foods pizza actually has a pretty good crust but the cheese, sauce is applied much too sparingly for New York style. The other thing to note is that it is also prebaked, so you are just warming it up in the oven, not baking it like other frozen pizzas. Sunset Foods in Highland Park has carried it for a couple of years. I tried it and thought it was OK, but the sauce was very sweet. It's called NY Slices (not NY Style). It's a pizzeria on Second St in downtown Highland Park. Personally I think it's ok at best, and the sauce is probably the weak link. It definitely can come through in a pinch, but it's also very bland. Gino's East makes a pretty decent very thin crust frozen pizza. I usually get them at my local Certified, Often times priced at around 3 for 10.00 It takes care of the pizza urge until the real thing comes along. thick wrote: Gino's East takes care of the pizza urge until the real thing comes along. Really? I didn't like the frozen Gino's East thin. I like their frozen deep dish when I don't feel like getting the real thing. 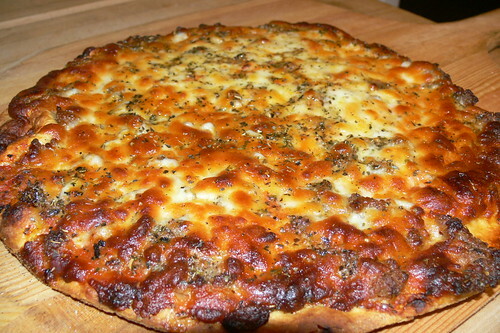 I have been partaking of the Culinary Circle Pizzas of late, too. If cooked at 450 from a cold oven, the thin crust product becomes quite crisp, the edges charred and the meat toppings a little crispy. The pepperoni pizza has a nice savory sauce, too. For 5 bucks with your sucker card, it's a pretty good (and decent tasting deal). not sure if it's been mentioned, but we've found a pizza stone helps the crust significantly. We have been having some tasty frozen pizza from Costco, the "Kirkland" brand cheese pizza come 5 pizzas to the pack and we have been pretty impressed. 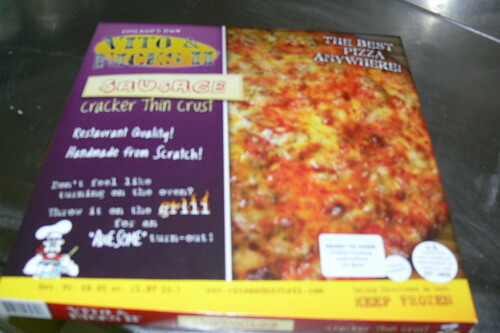 I recently tried a frozen Vito & Nick's II pizza from Happy Foods. Not even close to a real Vito & Nick's pizza, but less over the top acid in the tomato sauce than other frozen pizzas I've tried. For the slice style, the Jewel in Evanston sells an east coast brand (JB's? BJ's? can't recall exactly) that's really good and develops a nice crust texture in the oven. But watch out because they also sell a similarly packaged one (Old City?) that's like a slightly upscale Totino's (i.e. not good). Some had mentioned Tombstone when it was locally owned - that was awesome. Good memories. However, I had to share this story on Bad pizza. My better two thirds is CHEAP. 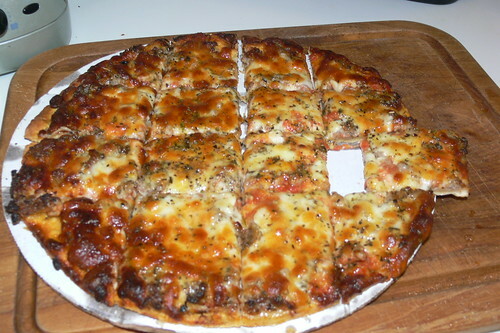 When I first moved to Milwaukee (she followed later, staying behind to sell the house) I did what I have always done - get cheap pizzas and dump everything on them that has to be tossed out of the fridge. I think it was a 6 for $10 deal for either Orv's or Tradewinds across from the short term apartment. I tried one bite and tossed all of them out. The wife comes through the door from her flight in, sees all of the pizzas in the trash, takes them out of the trash and puts them into the freezer. She tries one for breakfast the next day. I didn't dare say a word as she tossed them out from the freezer and spit out her bite of pizza. My rule of thumb is that if it is from Kraft, it is crap. They have (or did have - a number of their things were sold) a number of pizza brands. When seeing a new brand I check to see a parent company or google it if there is not one. I find Home Run Inn - Signature is the Best Frozen. Good Taste. Kraft sold its entire pizza business to Nestle a couple of years ago. I thought its DiGiorno (although it went downhill over time) and California Pizza Kitchen were pretty good for frozen. I find Home Run extremely bland.